This weekend in Detroit is the 58th Annual Detroit Autorama. The largest custom car show in the area. This is the official kick off to Spring in the Motor City! At the show, a Michigan based production company Exodus Picture, unveiled Firebreather. 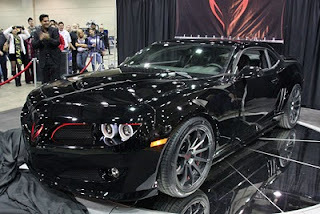 Based on a 2010 Camaro SS, this custom creation will be featured in a new science ficiton movie titled Jinn. The power train is stock but exterior modifications were performed by Classic Design Concepts of Novi, Michigan. Like what you see? Word is Exodus will offer 50 street versions for sale at just under $60,000 each. When Holden designed the Commodore fundamentals it made them flexible enough to be the starting point for a whole range of large, rear-wheel-drive cars. In the giant that General Motors used to be, there were no end of possibilities. However, GM could see the traffic lights changing ahead and didn't know whether to accelerate or brake. It ended up doing both, but before other projects could get traction, ran out of money. Apart from a few Commodores rebadged as Pontiacs, the Chevrolet Camaro is the sole result. It went on sale stateside a year ago and enthusiasts here were left holding their breath. The Camaro has a special place in Australia's racing history as a two-time winner of the touring car championship in the early 1970s, driven by Bob Jane. Kevin Bartlett twice put the car on pole at Bathurst. A raffle for a new 2010 Chevrolet Camaro 1LT is being conducted by Unity in the Community, Inc, a “501c3” non-profit organization located in Plant City, Florida. 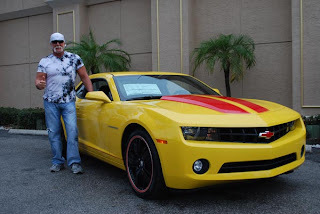 Stingray Chevrolet, located in Plant City, Florida and the BTLS Foundation (“Bubba The Love Sponge” Foundation) based in Tampa, Florida, are the source of the prize. The winning ticket will be drawn on March 14th 2010 (5pm EST) at The Florida Strawberry Festival, Plant City, Florida. Winner need not be present to win. All proceeds from the raffle benefit Unity in the Community, Inc., a 501(c)(3) non-profit organization. A $5 minimum donation per raffle ticket is suggested but not required. No purchase necessary. Winner must be 18 years or older. Employees, members and immediate family members of Stingray Chevrolet, Cox Radio, “Bubba the Love Sponge”, BTLS Foundation, Unity in the Community, Inc. and their affiliates/agencies are not eligible to win. Click HERE for details. 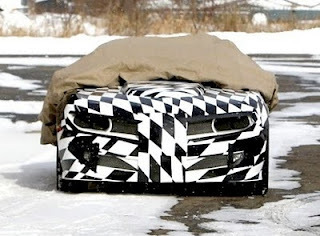 This was posted to MotorCrave this week, looks like someone is working on a Pontiac conversion kit for the 2010 Chevrolet Camaro! While this is not something I would ever be interested in, there must be enough interest for companies like this to put up the money for R&D. One of the most stunning cars to hit the McCormick Center showroom this weekend isn’t made in some off-site factory and it's definitely not a Hybrid. 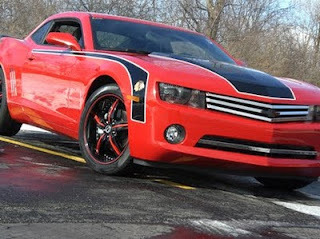 The Blackhawks custom Camaro is all muscle. The vehicle magicians at RealWheels, a Gurnee company, created the attraction for this year’s Auto Show in just a matter of weeks. But it wasn’t easy to pull off. RealWheels isn’t a custom shop. They’re a parts manufacturer, so when they make a custom car, they truly customize it.